I’m in rural Quebec and the polar vortex has rendered this already snowy environment a barren wasteland of ripping winds, endless snowbanks, and trashed roads. 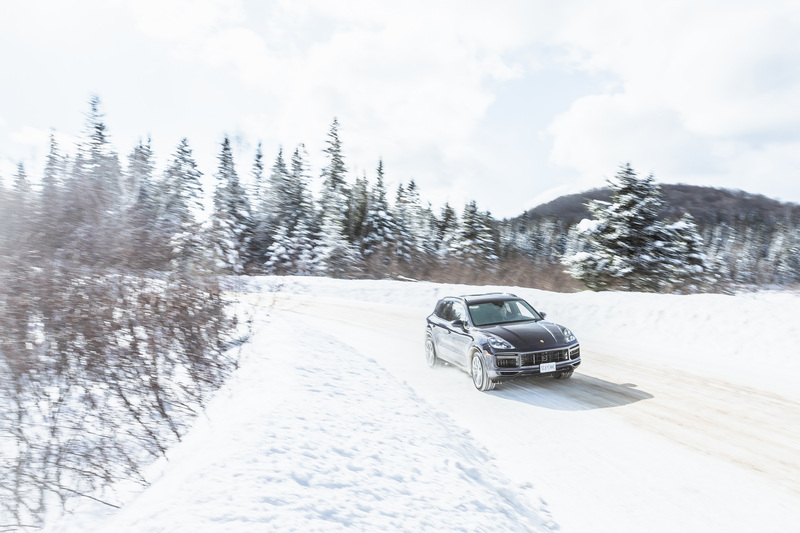 After a couple of days driving Porsche 911s on an ice track, I’m more than two hours from the airport and with the weather making travel harder by the minute, I’m not sure I’ll have a flight home. 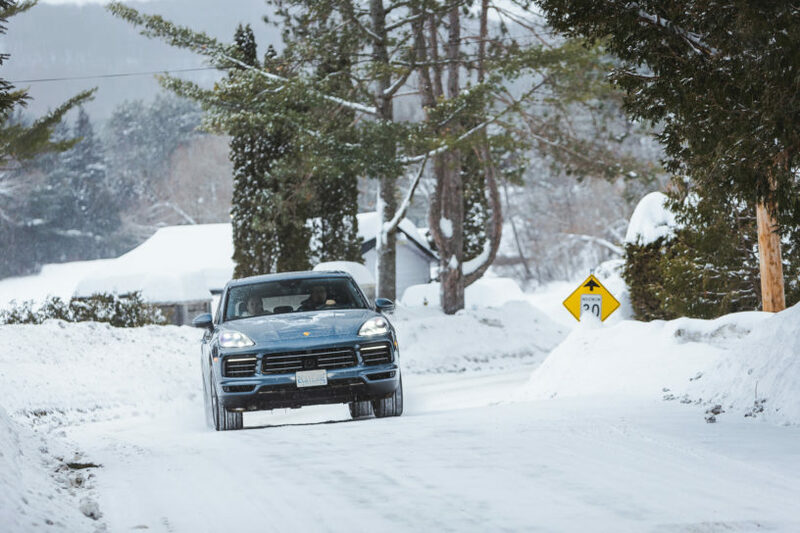 In fact, behind the wheel of the new 2019 Porsche Cayenne Turbo—with four-wheel-drive, more than 500 horsepower, and some fast-acting heated seats—it’ll probably take me longer to clear the security line than to get to the airport in the first place. Now in its third generation, the 2019 Cayenne is longer, lower, lighter, and offers incredible performance across the entire model range. 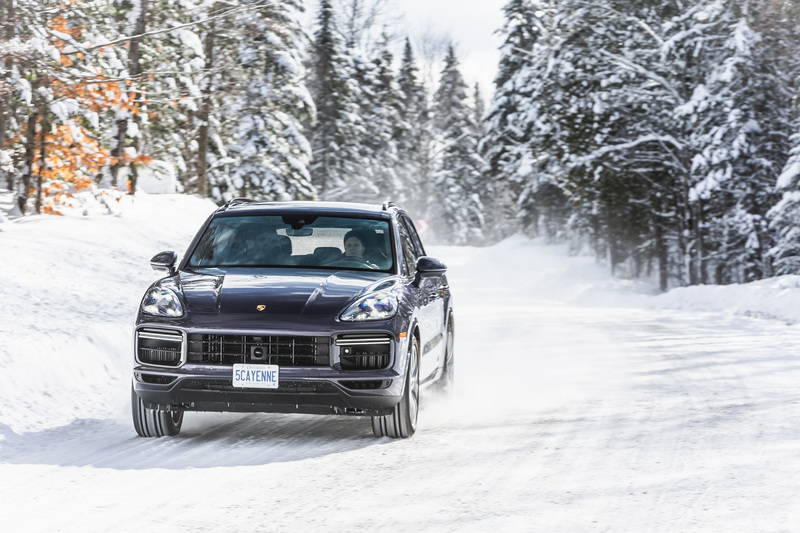 The Cayenne is the product that saved Porsche in the mid-2000s; the SUV side of the brand accounts for the lion’s share of their annual sales, as the past decade has seen a huge market migration from sedans to SUVs and CUVs. Boasting a new design that ports several styling cues from the Panamera, the new Cayenne does not mess with the established formula, but rather offers an evolution and refinement of what is already a very successful vehicle within its segment. With a new rear design and an updated interior, any modern Porsche owner will feel right at home in the new Cayenne. It’s roomy, comfortable, thoughtfully laid out, and made with excellent materials. Cutting down a snowy road as the GPS directions to the airport are projected onto the windshield via a new head-up display, my passenger is exploring the litany of settings and features on the large and very responsive 31.2 cm infotainment display. Likewise, any information I could need as a driver is available on two large HD screens that flank the analogue center tachymeter (a classic Porsche layout). 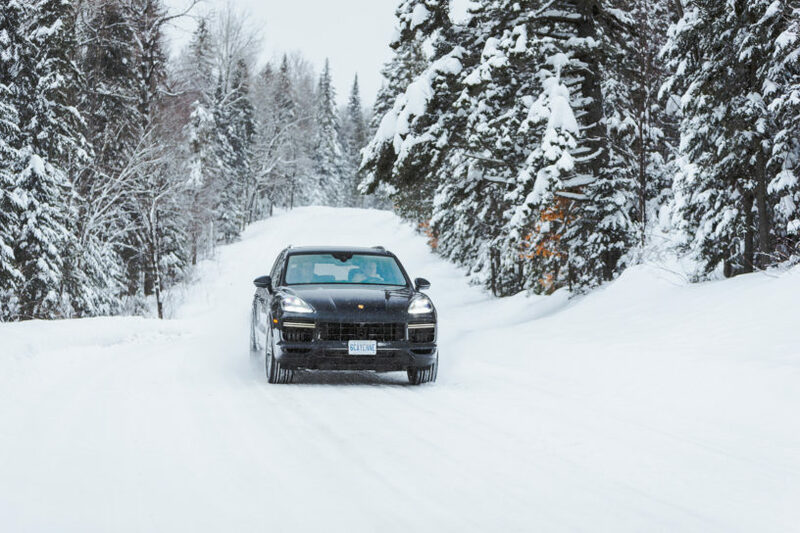 Rolling over some very rough and winter-beaten roads well outside of Montreal, most apparent about the Cayenne is how solid it feels. I remember this from the 2016 GTS I reviewed many years ago, it feels like a sturdy truck but manages to be quiet, comfortable, and especially for the Turbo, just so fast. Boasting a new Porsche-developed 4L twin-turbo V8, the Cayenne Turbo roars down any road with 541 horsepower and 567 lb-ft of torque. Mated to an eight-speed automatic transmission, this engine can actually push this large SUV to 100 km/h in as little as 4.1 seconds. Top speed? 286 km/h. Again, this isn’t a sports car, this is a five-passenger SUV with room for luggage. Those with less of a need for speed, might turn to the new Cayenne S model, with a truly lovely 2.9-litre twin-turbo V6that feels amazing and pulls hard with 434 horsepower and 406 lb-ft. The S may be less dynamic than the Turbo when it comes to especially sporty driving, but it’s certainly no slouch. Like any modern Porsche, the Cayenne Turbo’s entire attitude is controlled by a little dial on the steering wheel, allowing me to select one of three drive modes. In Comfort setting, the Cayenne is smooth and quiet. Click it over to Sport Plus and it turns edgy and aggressive, howling like a proper V8. Whether it be the top-spec Turbo or the Cayenne S, both drive beautifully, feel solid, and have more than enough power for anything you might ask of an SUV. The Cayenne S starts at $92,600 and the Turbo kicks things off from $139,700. With tough competition from very nearly every luxury car maker in the market, the Cayenne has earned an incredible and enviable reputation since the original E1-generation was launched in 2003. 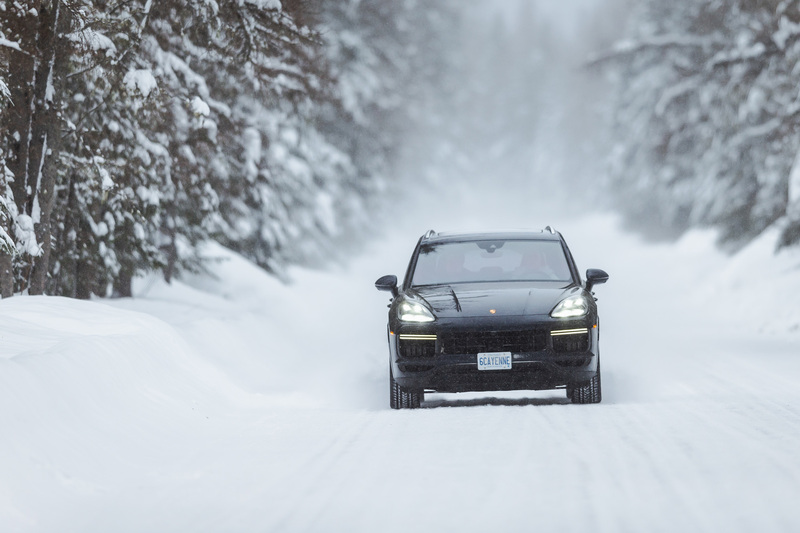 As the snowy miles flew past my view, the Cayenne cut a sure-footed path towards YUL. Truth be told, while I had no idea if my flight would ever leave Montreal, I had half a mind to ask Porsche if I could just keep driving home to Toronto. In a vehicle like the Cayenne, it’s a short trip, and it beats flying any day.